Guatemala City, August 2015. Photo Courtesy of Eric Hershberg. With President Otto Pérez Molina’s resignation early this morning, Guatemala lurches into a new phase in its long-running political crisis, with little prospect that this weekend’s elections will resolve much. The investigations into the Pérez Molina administration’s corruption, the national assembly’s unanimous vote to suspend his immunity, and the peaceful surge in popular protests demanding that he step down all suggest progress in the country’s efforts to build a functioning democracy. The UN-sponsored Comisión Internacional Contra la Impunidad en Guatemala (CICIG) fulfilled its mandate, and its example and training were arguably important factors in the ability of judicial officials in Pérez Molina’s own government to support the processes that led to his downfall. (Click here for an AULABLOG assessment of CICIG in May.) The Congressional vote to strip him of immunity was unanimous, including even his most loyal supporters, who until then had rejected popular clamoring for the president’s ouster. By the end of last week societal disgust with the political elite had reached the point that even the most recalcitrant of incumbents realized that their own survival required ditching the president. The comptroller’s office called on him to resign “to avoid greater social unrest that could have unpredictable consequences” – a sentiment echoed by powerful business groups and the Catholic Bishops Council. The Guatemalan Constitution and laws lay out the next steps. The Congress has accepted the resignation, clearing the way for Vice President Alejandro Maldonado – who replaced Vice President Roxana Baldetti after she was jailed in connection with the same corruption scandal – to take office. The first round of Presidential elections, with 15 candidates in the running, will proceed as scheduled this Sunday, despite calls from some civil society organizations to delay the balloting on grounds that the campaign regulations reflect the influence and interests of criminal elements. In all likelihood, a runoff round will be necessary six weeks later (October 25). The convulsions of recent months and deep distrust in government suggest that tensions will be high between now and then, but there’s no indication yet that civil unrest could threaten the electoral process, and military intervention appears to be a thing of the past. There is every reason to expect that a new President will be inaugurated on January 14. The elections are unlikely, however, to lead Guatemala into an era of less corruption and greater accountability, or to install leadership willing or able to spearhead economic and social policies to enable the majority of the population to live with dignity. 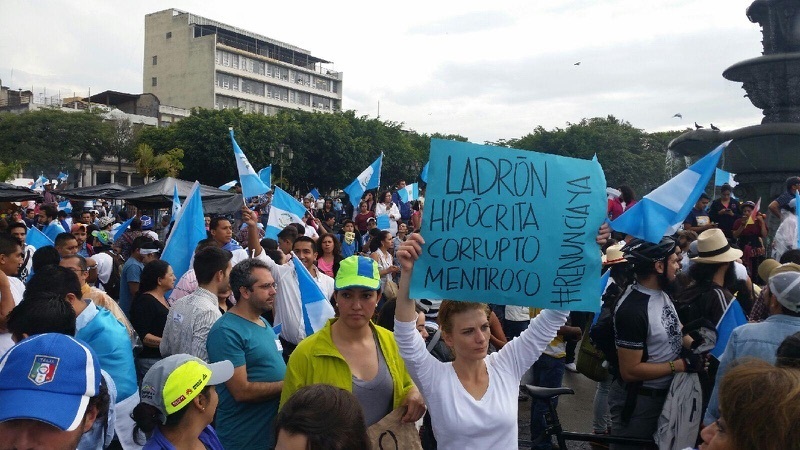 The slogans on the banners of the tens of thousands of protestors in Guatemala City’s central square lacked any message beyond a rejection of the status quo. “Throw them all out” and “I have no president”are potent rallying cries but do not address the core challenges of a country where the elite pay no taxes, half of all children are malnourished and tens of thousands of young people desperately seek better lives anywhere other than Guatemala. Electoral victory by any of these candidates would leave Guatemala with weak leadership at a time that most government institutions desperately need revitalization. Corruption is too deep-rooted for CICIG and its few allies in government to face down alone, and these candidates won’t use the presidency to carry out the needed purge. The organized criminal groups that traffic drugs and persons through the country and permeate governing institutions stand to grow only stronger, and the misery that plagues a population deprived of education, health care and jobs will continue unabated. U.S. Vice President Joe Biden’s billion-dollar aid package for Guatemala, Honduras and El Salvador, already in trouble in Washington, may have nowhere good to go. *Eric Hershberg, director of the Center for Latin American & Latino Studies at American University, witnessed the protests in Guatemala City last week.